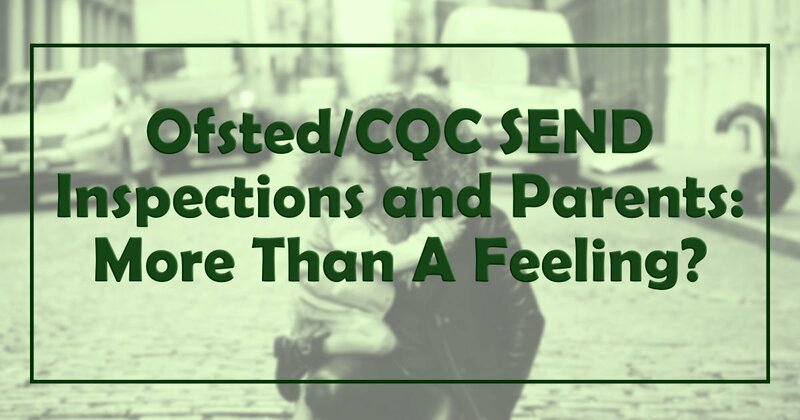 Home Columnists Ofsted/CQC SEND Inspections and Parents: More Than A Feeling? Six months ago, Ofsted & the Care Quality Commission began inspecting how well local areas are implementing the September 2014 SEND reforms. At the time of writing, they’ve published 13 ‘outcome letters’ showing what they discovered during their inspections. Each of these letters outlines the strengths and weaknesses of the local area’s SEND setup. But so far, only two local areas – Rochdale & Surrey – have concerned inspectors enough for them to activate their most serious sanction – instructing the local area to write a statement of intent. That’s a bold, clear claim. It’s also demonstrably untrue. According to the Department for Education, these eight local areas failed to process over one in three fresh EHCPs within the statutory timescale in 2015 - affecting 840 children & young people. This year, these eight local areas failed to complete more than 150 primary-to-secondary phase transfers by the statutory deadline, according to data obtained via Freedom of Information. According to the Ministry of Justice, parents from these eight local areas have submitted over 448 appeals to the Special Educational Needs and Disability Tribunal since the reforms kicked in. SENDIST appeals that reach a legal panel succeed 87% of the time. The Local Government Ombudsman has upheld at least 10 SEND-related complaints against these eight local areas since the reforms kicked in. Over 1,000 separate statutory breaches, in just eight local areas, based on a 10-minute scrub of publicly-available data. And yet, Ofsted’s annual report says all these local areas are meeting their statutory obligations. From a parental perspective, something is not right here. I think that Ofsted & CQC leaders are committed to the principle of inspecting well, without fear or favour. There are good people running these inspections, people who know what it takes to do SEND provision well. All the same, there are flaws; some of them big ones. One of the biggest is the way the inspection teams depend on seconded ‘expert’ senior managers from local authority SEN services and I’ll cover that in another SNJ article soon. Another issue though is how parents and carers are fitting into these inspections: how inspectors get our evidence, how good our evidence is, and sometimes, how our evidence seems to be weighed up. Things look like they are improving on this score – but there are things we can do to help. Local areas get a week’s notice that Ofsted / CQC inspectors are coming. The inspection team relies heavily (but not totally) on local authorities and established parent-carer forums (PCFs) to spread word that they are in town. Once they arrive, inspectors collect ‘parent views’ via three main ways: meetings with the PCF, talking to parents at the placements they visit, and an online webinar. There is no easy way for Ofsted & CQC to skin this cat. Parents are spread widely and thinly; they aren’t always well connected to PCFs or social media groups, they can’t always meet inspectors during school visits, and they can’t always attend webinars. Nonetheless, the experience of the last six months indicates that the current arrangements are frail. The notification process relies heavily on the good faith and effectiveness of local authorities and PCFs. If you can’t rely on either, then it’s a major challenge for many parents to find out these inspections are even happening, much less get involved. In my case, the answer’s yes, but that doesn’t tell you much. I had to invoke the law repeatedly to get my LA to meet my kids’ needs effectively. Only a fool would interpret “yes” as evidence of a local area working well. The Ofsted / CQC local area inspection handbook requires inspectors to seek parental “views” as a “crucial” and “central feature of inspection activity.” That sounds laudable. I’m not sure it is. The choice of the word “views” here is important. “Views” are information that might be based on perception, opinion, and emotion. “Views” might be tied to reality, or they might not. There are two frustrating things about this. Firstly, parents are perfectly capable of supplying hard evidence. The SEND process throws it up, in spades. I can map where, when and how the local authorities I’ve lived in succeeded and failed to meet their legal obligations to my kids. “Views” did not get my kids’ special educational needs met. Explicit evidence did. The second big problem with treating parental evidence as “views” is that it can allow bias – conscious or unconscious – to seep into the evaluation of parents’ testimony. For most of these cases, parents will have been capable of supplying hard evidence to back up their views. Were they given the opportunity? If parents and carers had a clear opportunity to provide detailed evidence and didn’t take it, then fine. But if parents didn’t have a proper opportunity to present hard evidence or to have it taken seriously by inspectors, then that is light years away from fine. Many of the situations here that parents are described as ‘feeling’ are breaches of the SEND Regulations and/or the SEND Code of Practice. Did inspectors even realise this? This might just be occasional, unconscious bias. Some of the most recent inspection outcome letters have been much more neutral in the language that’s used to characterise parental evidence. Nancy Gedge – a parent of a child with Downs Syndrome, a teacher, and an all-round top person (and also SNJ columnist) sums up this subtle, insidious professional ‘othering’ in this post on her own blog. One of the guiding principles of the new SEND legislation is partnership – parents working as equals with professionals, as experts in their child through experience, as full members of the team. Partners, not spectators. This can, and surely must, apply to the process of inspection too. The default mechanisms for capturing parental evidence don’t work well. And right now, you cannot automatically assume that inspectors will recognise statutory breaches. So that means parents need to go beyond bringing “views” to the inspections. We need to bring evidence to the table. And we need to bring evidence that is tethered to our kids’ progress and wellbeing and to the local area’s legal obligations. If you are a member of a well-organised, well-prepared, fearless and representative PCF, then get involved. Hertfordshire Parent Carer Involvement’s approach to their local area inspection is a great example of what can be done. Herts PCI put in some serious groundwork before the inspection, collected detailed survey responses from over 600 parents, and handed it over to inspectors when they arrived. If your child is making good progress because of the local area’s actions, don’t just say so: explain in writing what they are doing well, and explain what positive impact it’s having on meeting your child’s needs. If your child is not making good progress because of the local area’s actions, again, don’t just say so: explain in writing what they are not doing (or what they are doing badly), and detail the impact it’s having on your child. If your local area is acting unlawfully, then detail which parts of the SEND legal framework your local area is breaching, and how they are breaching it. Again, detail the impact that unlawful action is having on your child or young person. Inspectors don’t have a lot of time to get the job done. Make life easier for them by keeping the evidence you send short, snappy & to the point. Sending inspectors a 600-page SENDIST bundle won’t work, nor will a lengthy email chain where the smoking gun is buried 3 pages into a nested paragraph. If you send evidence that criticises a local area, make it clear to inspectors that what you are sending them is for the purposes of inspection evidence. Inspectors can’t resolve individual complaints, and they are not going to sort out your individual case on the spot. None of this guarantees that inspectors will act on the evidence you provide – but it increases the chances that they might. And if nothing else, Ofsted won’t be able to claim in next year’s annual report that failing or delinquent local areas are meeting their legal obligations. Great piece: your analysis of the language used in Ofsted’s reports certainly reveals built-in bias and the questions inviting parents’ views are simply inadequate for the purpose. I hope Sean takes a look at your suggestions. Thanks Barney, that’s much appreciated. I only covered it briefly in the (overly-long) article, but there are outcome letters that depict parental views & evidence in consistently neutral, measured tones, and it is obvious in these cases that parental evidence was used to pursue lines of inspection enquiry. Those outcome letters are for Rochdale, and for Surrey. Both of these local areas now have to produce a statement of action. There are inspectors, however, who are SEND leaders in areas which are themselves breaching SEN law. Can there really be a thorough commitment to improving SEND provision through these inspections when this is the case? Thank you for your illuminating analysis of the language used in the reports and thinking about which parents’ views and experiences get heard. I think there’s a definite difference between the lead inspectors – Ofsted’s HMIs, most of whom have a solid track record in running SEND provision at the coal-face as head teachers, unit leaders or specialist teachers – and the seconded inspectors from local areas. I share your concerns about the second group, in a major way. The next SNJ post I’ll put together will take a look at this crew. It’s not pretty. PCF’s are not fit for purpose. It is time for a National Parent and Carer Pressure group. Our borders are a weakness. Rarely do I read something that articulates exactly how I am thinking but this is an exceptional article and mirrors my concerns. Whilst I believe that the abject failure of LA’s should be highlighted to the core I do also feel that the accountability of all involved in the half-arsed approach to the implementation of this code of practice and all that comes with it should be highlighted. From the Elected decision makers via the self-righteous QUANGOS to the DfE funded ‘coasters’ that are CaF, etc. etc. I attended a conference in April of this year, a day of my life I will never get back, but in discussion with the lead presenter, I suggested that the transition from Statements to EHCP’s has to be more than simply ‘Placing a throw over an old sofa’. At this point I suspect many people are happy to hang on to their child’s statement having seen/read about the general level and quality of EHCP’s. The fact that implementation grants have essentially just been thrown at antiquated and failing AR teams (along with SEND advisors who are often just ‘agents of fear’ to the clueless) is for another day (not a pilot project insight in my neck of the woods). I don’t want to participate anymore I want to co-produce. The agenda needs to be professionalised so that volunteers can be volunteers. The weight of responsibility that is placed on PCF’s is comically sad. Before anything can change an apology to SEND children, young people and their family’s needs to be made. The SEND community will not hold a grudge they will accept your apology and move forward with you, because that is in our DNA – making the best out of a challenging situation.